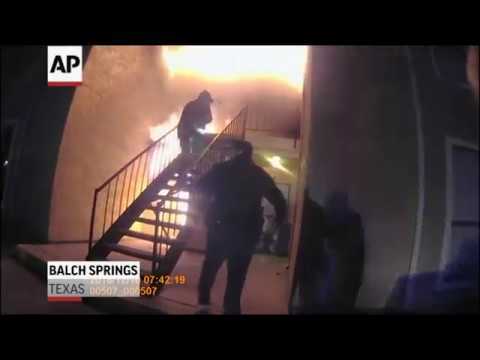 BALCH SPRINGS, Texas (AP) — A police officer’s body camera caught the moment a boy jumped from the second floor of a Dallas-area apartment into the arms of officers below. Video obtained by television station WFAA shows Balch Springs Police officers trying to get inside the apartment building on the outskirts of Dallas. When the shooting flames prevent them from accessing the building, Officer Corey Jones throws a baton through a second-floor window from the ground and the boy is coaxed into jumping to the officers below. The fire department arrives soon after and uses a ladder to rescue his mother. The name, age and condition of the boy haven’t been provided, but he was able to walk and smiled to officers as he sat wrapped in a blanket. Police say the mother and son are recovering.